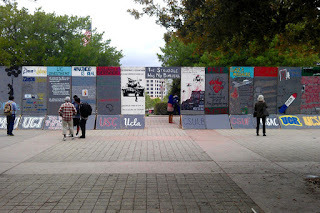 Students are fighting back against a series of sanctions imposed on them by the University of California, Irvine (UCI) as punishment for chanting and clapping during a campus event with Israeli soldiers in May. Administrators launched an investigation into Students for Justice in Palestine following the protest, even though members of the group say that they were the ones who endured days of harassment, including sexual slurs and racist intimidation, by the Israeli soldiers who were invited to give a talk about the Israeli army. The students believe the harassment was an attempt to provoke a reaction. In late August, UCI found the campus chapter of Students for Justice in Palestine responsible for “disruption” and sanctioned the group with two years of probation, 12 mandatory meetings with a dean to discuss free speech, and a requirement to meet with university officials two weeks before hosting or co-hosting an event, according to Palestine Legal. In those pre-event meetings, students will be expected to discuss how SJP is allowed to respond and will be mandated to review the university’s protocols and policies. The students filed an appeal against the university’s sanctions on 31 August. “It’s outrageous that the university is punishing us, students, instead of protecting us from aggressive foreign military agents on campus,” said Daniel Carnie, a student who was amongst those targeted by the Israeli soldiers. “We were scared, and the administrators did not intervene, so we spontaneously erupted in a chant. We are appealing this unfair decision,” Carnie added. Following the protest, students say they have faced cyberbullying, including death threats, harassment over social media and a website that lists students’ names, phone numbers and personal addresses with sniper targets on their faces, reports Palestine Legal. The university has so far ignored such threats against the students, as well as the harassment by the Israeli soldiers leading up to the May event, the legal group adds. Documents obtained by Palestine Legal through a freedom of information request show that over the last year, Israel advocacy organizations have consistently pressured the UC Irvine administration to crack down on Palestine activism. In early July, a letter authored by the Louis D. Brandeis Center, a right-wing Zionist lawfare group, along with two Israel lobby groups, Students Supporting Israel and StandWithUs, was sent to UCI officials pressuring the university to “pursue the prosecution” of the protesters and “discipline” SJP. The letter, seen by The Electronic Intifada, urges the university to criminalize the protesters under California Penal Code 403, which describes the breaking up of an event as a misdemeanor – a law which was used to investigate, prosecute and convict students in 2011 who protested a speech by Israel’s then ambassador to the US, Michael Oren. The students, known as the Irvine 11, were subjected to a year-long criminal investigation, and a jury trial resulting in a guilty verdict. Last year, the administration punished SJP “for being too loud in a protest that occurred outside an event,” Jackson said. “This year, they are punishing students for clapping and chanting spontaneously – and that chanting happened only after a physical assault occurred in the room,” she noted. Levying these serious bureaucratic sanctions against SJP sets the group up to fail and acquiesces to Israel lobby groups that are demanding that UCI ban the group, Jackson said. “They didn’t outright suspend SJP as a club or take away its club status, but instead they gave them a bureaucratic requirement that is extremely difficult to meet, for anyone,” she said.